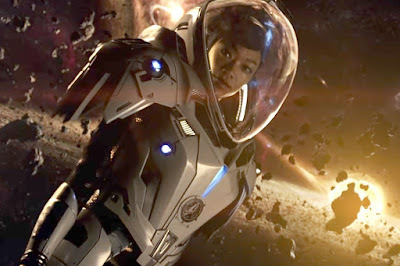 John Kenneth Muir's Reflections on Cult Movies and Classic TV: Ask JKM a Question: Star Trek Discovery Trailer? Jill, that’s a great question! I am posting the trailer below as a reference point for the discussion. Okay, first things first: what did I think of the trailer? This new incarnation of Star Trek looks cinematic and spectacular, and the trailer also suggests that the new series will possess a sense of fun. The special effects and make-up may be pure 2017, but we are still going to examine the final frontier alongside bizarre aliens, with weird customs. I find that cool. The spirit of Star Trek lives. The production values are extraordinary, just as one would hope. I understand that the elephant in the room -- or aboard the starship -- in this case, is the non-“historical” production design. 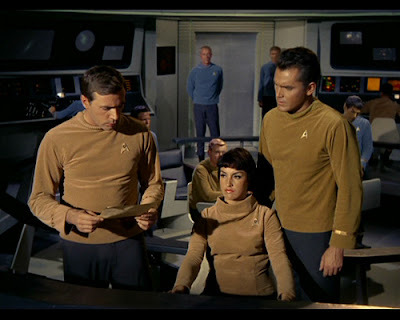 Fans have complained that this ship, and its technology -- as well as the uniforms of the officers -- don’t resemble the original series and its era. And, of course, Discovery is set ten years before The Original Series. I am sensitive to this criticism, for certain. In a very real sense, Star Trek is a period piece. 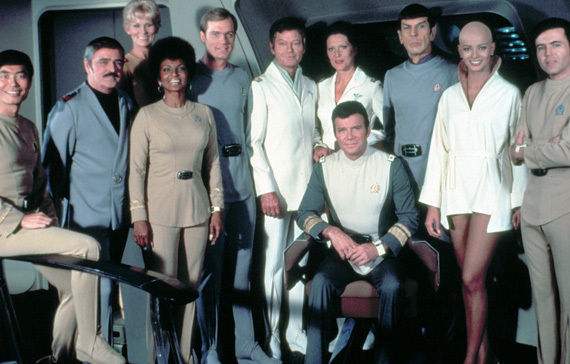 We know what the 23rd century should look like…and it didn’t look like this. By contrast, Rogue One (2016) featured a forty year old “look” successfully, and did not revise it to keep up with the times. Old Star Wars was respected, recreated, and put front and center, without hesitation. So why could the creators of Star Wars be faithful, visually, to their universe’s (dated) visual history? Was there not some way for the makers of Discovery to do the same? 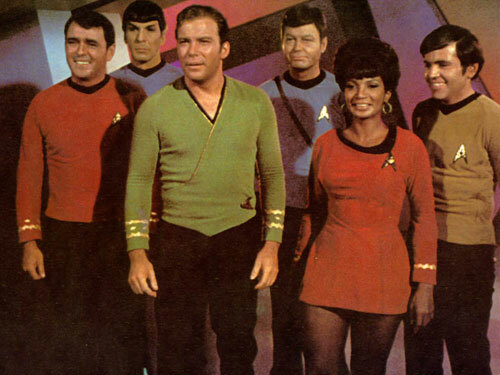 Does Star Trek inherently deserve less respect? On the other hand, I know that time has passed, yes, and that our culture has moved beyond the “blinky lights” aesthetic of Star Trek (1966-1969), as well as the bright, colorful, clean lines of 1960’s futurism. This Star Trek series must thrive in a 21st century environment, and appeal to a generation that has grown up with smart phones and other modern technologies. So I understand why a new look was deemed necessary in terms of starship interiors for Discovery. We also have some counter-evidence about faithfulness, to cheer up old fans: the communicator and tricorder designs look familiar, so there's that to consider. Other changes are of more concern, at least to me. I do hope we get an explanation for why the Klingons look different here. Perhaps they are a variant of the race we haven’t seen before. Changing the Klingon look without an explanation seems, at this point, a change for the sake of change, and unnecessary. But, let's be clear: we are all responding to clips from a two minute trailer. The series may fully explain all of this. I try not to get overly upset about things before I have all the information about them, and I think that's a good mantra for fans at this point. Still, it is baffling to me why the Starfleet uniforms of Discovery don’t match at least the color coding audiences saw in “The Cage” or the Original Series. To be absolutely clear: I don’t expect the uniforms to be identical to a design from 50 years ago. 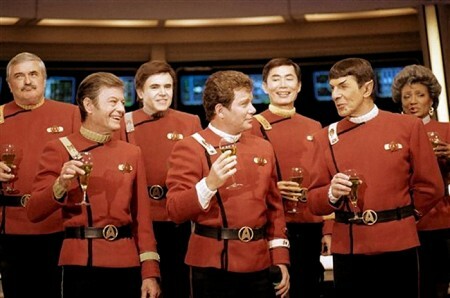 I am fine with a new design, given how often Starfleet uniforms change, apparently, at the drop of a hat. 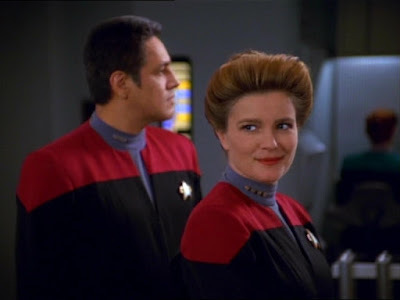 But a nice way to remind us of the show’s in-universe “historical” era would be a nod, at least, to the command structure/department color scheme. I can see why some longtime fans are upset about these cosmetic changes, since they don’t reflect what we know of the “in-universe” history, but -- again -- in no way are these factors a deal breaker for me at this point. I still look forward to the series, and feel that Star Trek works best in a series setting. In terms of the negative response to the casting, I won’t mince words: it embarrasses me. It makes me sad that there exists a contingent of viewers who are (derogatorily) calling this program Star Trek: SJW (Social Justice Warriors). This snide designation has been given, apparently, because we have an Asian captain, and an African-American first officer on Discovery. I typically find that -- although there are indeed some real SJW pains mouthing-off on the net -- the bigger pains, by far, are the ones who complain incessantly about social justice warriors by using that pejorative term. Basically, railing against social justice warriors is a way of squelching debate and discouraging engagement and activism. Social progress/justice is not, in and of itself, a negative thing. Previous generations of those who pursued social progress were known by names such as "abolitionists," or "suffragettes," or "Civil Rights Activists." Let’s face it: these A-SJWs are, in some sense, the same folks who argued, twenty-five years ago, that you can’t add anything to established Academic “canon” in universities and colleges, to permit new literary voices into a field of study. Under the umbrella of “freedom,” the A-SJWs (assjaws?) actually are attempting to gate-keep, limit freedom, and establish a box around what is acceptable in art. In terms of Discovery, the argument is even more nonsensical. Star Trek has always been explicitly about social progress, about the next frontier of social progress. 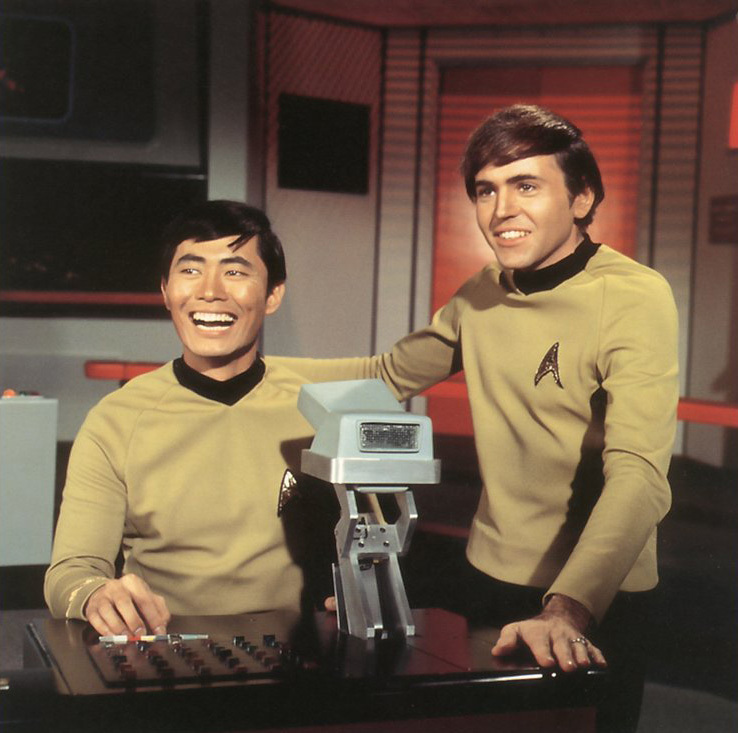 The original series put on the bridge of a UFP starship a former enemy of the United States (a Japanese man) and a then-current enemy of the United States (A Russian!) and said that in the future of the 23rd century, we would be at peace with both; that old prejudices -- and current ones -- could and would fall away. 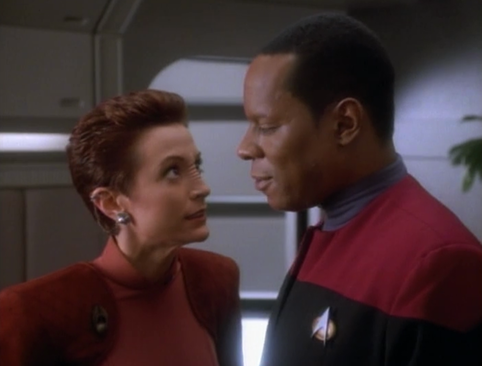 Star Trek Deep Space Nine (1993-1999) had an African-American man and a female first officer in command of a space station. It was the next frontier of social justice. And Voyager (1995-2001) landed a woman in command of a starship, with a Native American man at her side, as first officer. 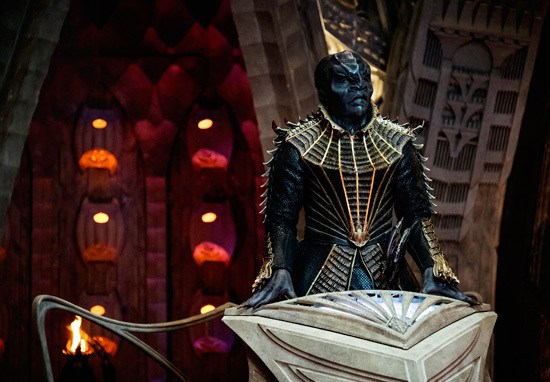 Discovery is not one iota out of line with the grand historical tradition of Star Trek. In fact, I’ll make a bolder statement. 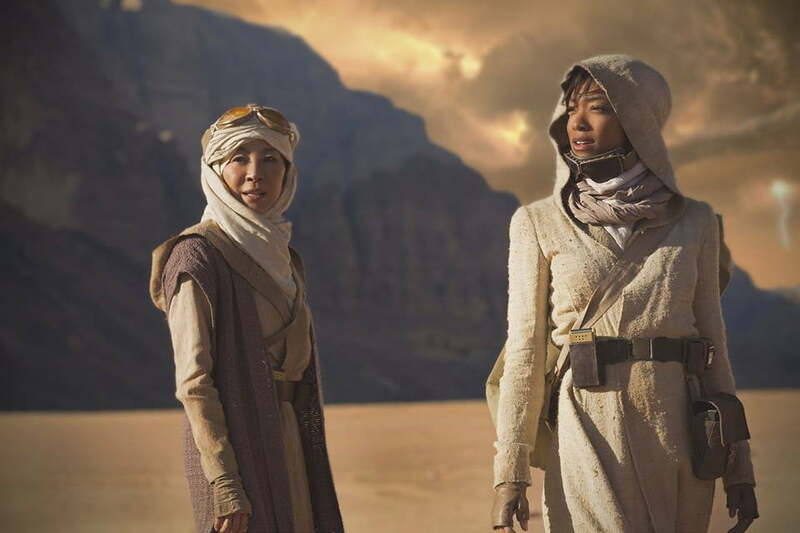 Discovery is more aligned social progress-wise with Star Trek history and tradition than it appears to be at this early juncture, in terms of production design. To belabor the point, here’s the l reason why I said that so many A-SJWs can be bigger pains than the people they criticize: many are hypocrites. I see them write, all the time, on the net that they only judge a work of art on “merit,” not on “surface” ideas like gender, race, ethnicity and so forth. Yet in dismissing Star Trek: Discovery now -- from a 2 minute trailer -- what are they basing their caustic dismissal on? Because...they haven’t seen a single episode yet. Not a single episode. So as much as social justice warriors can be irritating, at least they are up front, typically, about what they want to see in the arts: equal representation. Anti-social justice warriors are supposed to, in theory, be about not judging by that value. Yet they are the first to complain about a black Stormtrooper, an Asian captain, or an all-female screening of Wonder Woman (2016). So the truth is exposed. They aren’t judging merits, folks. They took one look at Finn in The Force Awakens, or an Asian Captain in Discovery, assume a political agenda they don't agree with, and don’t wait to judge on the merits. Instead they instantly assign a pejorative term (SJW). And that’s why so many of these ASJWs are the true "snowflakes," to use a currently in-vogue term. They are so determined to gate-keep based on their own political agenda -- which they hypocritically claim isn’t political at all -- that they can’t even wait and see what Star Trek Discovery actually delivers in terms of art, drama, and character, to make a fair assessment. They certainly don’t appear understand the tradition of Star Trek, either; that the franchise has always pushed social boundaries, to show us how we can “live long and prosper” in a more egalitarian, diverse society. So, in response to the second part of the question you asked: the grotesque reaction to Discovery by anti-social justice warriors saddens me, just like the response to Furiosa in Mad Max, or to Finn in The Force Awakens saddened me. It’s just another shade of prejudice and gate-keeping in the arts. John, my one and only concern about Star Trek:Discovery is the production design. If it is good, then I am okay with it not fitting into canon history. It would have been much more proper if, as you stated, the colors of the uniforms were canon. J.J. Abrams had respect for Star Wars production design much more than he had for Star Trek. I do not think a Budweiser Brewery would have been allowed to be the engine room set of a Star Wars star destroyer as it was the Enterprise in the 2009 film. I'm with you on the uniform classification, John. I fully understand and buy into the idea that even a prequel has to be packaged with the trappings of the current audience taste in order to have currency, so that everything has to have a "retro" look and feel while actually appearing updated beyond Star Trek TOS. I get that. But I find it just annoying--and stupid, actually--that this somehow gets reduced down to ignoring even what little was really codified in original Star Trek. Why does currency mean there cannot be some adherence to the uniform and departmental classification schemes originally established? It would help not only connect the old with the new, but also lend a sense of authenticity to Starfleet. Uniform schemes and departmental structures don't arise out of nowhere, they arise out of traditions that are connected to good old common sense. Ignoring things like that for no reason except to make everything different just draws attention to and creates fuss over minor details in a way that producers actually don't want and are trying to avoid. If you keep throwing babies out with the bathwater, you can't complain when people look around and exclaim, "Hey! Weren't there babies in here earlier? Where'd they all go? And why?" Very nicely said, and I couldn't agree more. In fact, I have stopped reading comments on general Trek websites, such as Rod Roddenberry's, because a great many of them are so horribly abusive and abhorrent. In one case, a woman had the temerity to state that she enjoyed Star Trek Beyond. The reactions ranged from "how dare you" to "you should kill yourself," and I am not even exaggerating. Reading such comments and hearing of the racial and misogynist backlash reminds me of a cartoon from the book "The Days Go By Like Broken Records" by Jeff LeVine. In the cartoon, two twenty-somethings get their hands on a high-powered rifle and start shooting random people as they walk down the street. They're on a brutal shooting spree, overjoyed at the murders they're committing, when one of them suddenly remembers that there's a new episode of Star Trek - The Next Generation on that evening, so they run home to catch it. They love Star Trek, but can't hear at all what it is trying to say to them. The people calling Discovery "Star Trek: SJW" would never make it on the starship Enterprise. They would most likely be patients on Tantalus V. They're not fit to hold Captain Kirk's jock, and I'm being nice. I'm excited to see what the creators of Star Trek: DISCOVERY have done. It's always more fun to look into the future, rather than to stay in the past. To borrow a line from a certain, and underrated, SF film and apply it here with little modification: "(Star Trek) must evolve." I live in downtown Toronto and if someone on the "Discovery" team was able to sneak me into the sound stage I would take a pass. And I don't mean a 'stage pass'. To be fair, however, "Discovery" may turn out to be just that. One never knows. When the CTV network premieres it here in Canada I will at least watch the first episode (chapter).